Binance coin, BNB, the token of the China-cryptocurrency exchange, led the market on Wednesday with a 10% gain versus the USD by the end of the New York trading day. Against the consolidating Bitcoin, it hit an all-time-high level during the trading day, before erasing some of the gains. 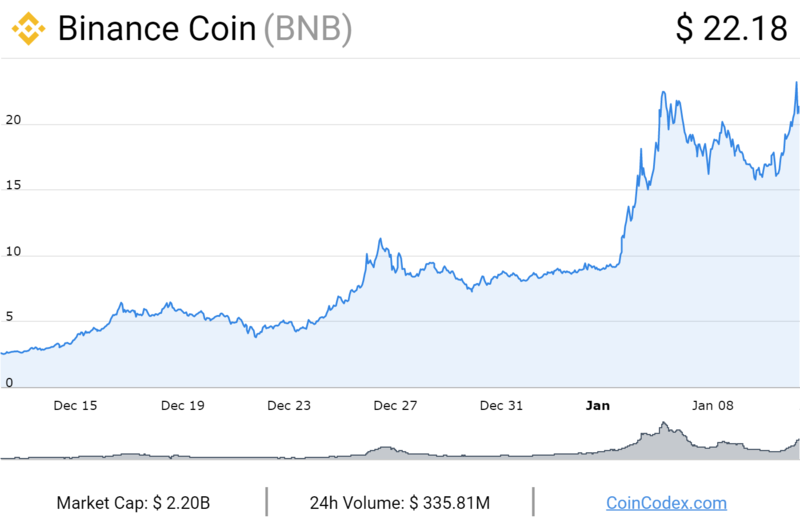 The sharp rally pushed BNB’s market capitalization to a five-month high of nearly $2 billion, making it the 18th largest cryptocurrency by market capitalization. One reason for the sudden surge of crypto exchange tokens such as Binance , Next.exchangue, KUCOIN and Huobi in an otherwise gloomy market could be the liquidity they offer. The market seems to be learning that these exchange-based crypto-assets are basically a representation of the monetization of trading volumes. The majority of the market appears to agree that the trading volume could increase in the near future. Meanwhile the future value of major cryptocurrencies such as Bitcoin remains a mystery. The sharp rally pushed BNB’s market capitalization to a five-month high above $1.9 billion, making it the 17th largest cryptocurrency by market capitalization. Further, the rally is backed by a 160 % rise in trading volume over the last 48 hours, so the stellar gains look sustainable. Meanwhile, the binance coin-U.S. dollar (BNB/USD) exchange rate hit a 5.6-month high of $17.60 on Binance and was trading at $16.80 at press time – up 17 % in the last 24 hours. A detailed look at the individual markets reveals that the BNB/BTC and binance coin-tether (BNB/USDT) pairs account for more than 85 % of the total BNB trading volume ($0.148 billion) seen in the last 24 hours.